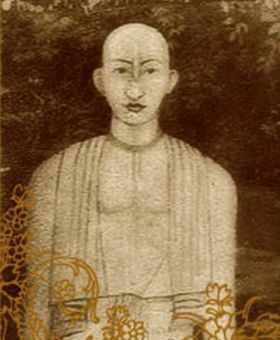 Baladeva Vidyabhusana, the author of Govinda Bhashya, the first Gaudiya commentary on the Vedanta-sutras, appeared in Remuna, Orissa, in the late 1600s. In 1706 he was sent by Srila Vishvanatha Chakravarti Thakura to Galta (near Jaipur, India) to prove the authenticity of Chaitanya Mahaprabhu's movement. The local Ramanandis (a branch of Sri Vaishnavas) had charged that the Gaudiya Vaishnavas, having no commentary on the Vedanta-sutras, were not a bona fide disciplic line and therefore they had no right to worship Govindaji or any of the other Deities of Vrindavan. By the grace of Govindaji, Srila Baladeva Vidyabhushana then swiftly wrote the Govinda-bhashya commentary. He also wrote commentaries on the Upanishads and the Bhagavad-gita.